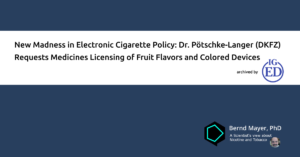 Prof. Dr. Mayer - New Madness in Electronic Cigarette Policy: Dr. Pötschke-Langer (DKFZ) Requests Medicines Licensing of Fruit Flavors and Colored Devices - Interessengemeinschaft E-Dampfen e.V. Archived version of Prof. Dr. Bernhard-Michael Mayer’s blog post. Dr. Martina Pötschke-Langer (German Cancer Research Center, DKFZ) promotes the interests of the WHO Tobacco Control in Europe. In support of WHO policy, she has pulled out all the stops in the past to get electronic cigarettes under the medicines licensing regime but, fortunately, lost the battle. The EU parliament, as well as several courts in Europe, have unequivocally decided that electronic cigarettes and nicotine containing liquids are not medicines in the absence of health claims made by retailers. You thought the issue is settled now? Far from it! Pötschke-Langer doesn’t give up! The DKFZ suggestions exceed by far the already unacceptably tough and unsubstantiated EU directive. It is obvious that Dr. Pötschke-Langer is avidly trying to discourage smokers from switching to electronic cigarettes. Her most amazing suggestion is related to the alleged appeal of electronic cigarettes to children. Pötschke-Langer claims that children need be protected by banning all liquids containing non-tobacco flavors, as well as devices in colors other than gray or black. Since the sale of electronic cigarettes to minors is – or will be – prohibited anyway, Pötschke-Langer apparently worries about the appeal of devices brought home by Mummy or Daddy. Mummies and Daddies are permanently bringing home potentially Filed Under: Blog Tagged With: DKFZ, electronic cigarettes, Germany, regulation dangerous goods, including knives, toilet cleaners, alcoholic beverages and, last but not least, tobacco cigarettes. We cannot ban everything that could be harmful and must entrust parents with the responsibility to protect their children from hazards. products. Obviously, Pötschke-Langer is hoping that multicolored atomizers and batteries sold as medicines will outcompete the boring gray and black devices then remaining available as consumer products. By now everybody must have realized that Pötschke-Langer has lost her last contact to reality. I don’t think we need to worry that this madness will ever come into force. And even if so, such a regulation would have little chance to survive before courts. Besides illustrating the desperate fight of this lady against electronic cigarettes, her proposal sheds light on her profound lack of knowledge about the vaping community. If fruit-flavored ready-to-use liquids should be banned, consumers will prepare their liquids themselves with flavors of their choice that will remain freely available as food additives. Moreover, I suppose most vapers will not particularly suffer if the availability of electronic cigarettes should become limited to gray stainless steel devices. Bad luck for women enjoying pink batteries!